In a world of polymer framed auto loaders, I guess I'm sort of a throwback. Of the several handguns I own, both revolver and autos, my caliber for daily carry is the tried and true .357, and the weapon I choose to carry is a Rossi model 462 .357 magnum (2", 6-shot SS snubbie), which I have affectionately named "Marvin". Now I can hear all of the groaning from The Rossi "bashers", but I have carried this gun for the last 4 years or so and have fired approximately 1000 rounds of various loads (including .38 special, .38 special+p, and full house .357 magnum without a single breakage or malfunction. I have heard a number of complaints concerning the quality of Rossi firearms, but this gun has served me faithfully, and it is not babied. The Rossi .357 magnum goes with me everywhere - fishing, hunting, camping, on my motorcycle and has seen its share of rain, mud and taking a dip when I fell in the water during a fishing trip. With just a routine cleaning and lube, it's always ready for more, and the finish is as good as it was the day I bought it. I'm not concerned about lack of fire power as I always carry two reloads and with plenty of practice, I can reload almost as quickly as the average guy with an auto loader. I put as much faith in this gun as any S&W or Ruger owner does. 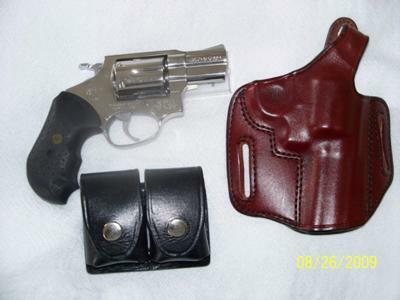 The Rossi .357 magnum revolver is carried either in my Don Hume belt slide or a Galco paddle holster. It's a combination that has served me well. The snubbie is easy to conceal and allows me to carry a "full power" weapon with no problem. On occasion and when my mode of dress dictates, I carry it in a an Uncle Mikes ankle holster. For me, it's truly an all around gun.